I recently had the opportunity to interview Ralph and Barbara Shoots, two of the top chinchilla breeders in the country. They have led the industry the past thirty years, winning many national championships. I thought there would be no better resource to advise the beginning breeder, so here is the interview in its entirety. Tristan: How long have you been raising chinchillas? 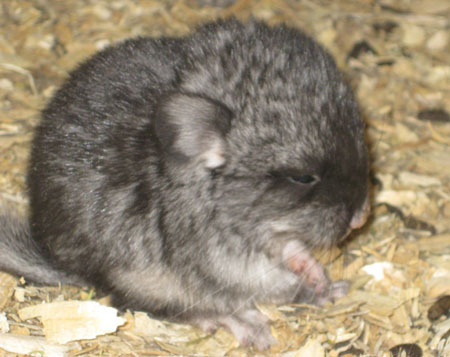 Shoots: We purchased our first Chinchillas in 1967 and have been full time ranchers since 1972 with no other income. At one time our herd consisted of 6000 animals, however, at present we maintain about 2500-3000 animals (depending upon the time of year). Tristan: Can chinchillas be a profitable business venture? Shoots: It is our belief that with quality, ranchers still can do well in our industry as there are many more avenues in which to sell the young than ever before. Tristan: Do you have any suggestions for anyone who is just starting out with breeding? Shoots: Build a strong standard herd first. Unfortunately no one does this anymore. 	If you have excellent standards you can get very good mutations in just one generation. Good standard chinchillas are the key. All excellent chinchilla breeders today (if they will be honest with you) will tell you it is impossible to get top quality mutations without continually feeding in excellent standards. Dont try to breed every color. specialize in only 1-3 mutations, if you breed them at all and stay away from recessives. Even the best chinchilla breeders ever cannot produce good consistent qualities in the recessives. Dont try to follow everyones advice that you see on the internet. Listen mainly to those who are successful and have been successful in breeding chinchillas for many, many years. The opportunities in chinchilla today are the greatest ever because there are so many outlets for our production. Tristan: Have you made any mistakes you could warn us about? Shoots: We have made the same mistakes that everyone makes. Dont try to breed for all colors. We also rushed out to purchase one of every color. We understand the excitement in seeing all the different colors. We never raised the recessive colors as we feel they are not compatible with breeding a quality standard herd. Once we realized the importance of the standard chinchilla to all ranchers, we set our goal to raise the best standard chinchilla that could be raised. Of course, we continue to improve each and every year. After our standard herd was established it was a simple thing to add Mutations (dominates) and produce top quality mutations the first generation. This is due to the strong standard characteristics we worked so many years to produce. Dr. Kochs feed. This is what we have fed ever since. We sure wish we had listened to them from the beginning as it would have saved us a lot of trial and error and time wasted. We see today that the newer breeders tend to try to reinvent the wheel and problems that were bred out years ago are again cropping up. It is a shame to see this happen. Lots of years of work by many top breeders were put aside. Tristan: What percentage of mutations should a serious breeder have? Any that we should avoid? Shoots: We maintain 90-95% standards. This helps maintain the highest quality in both our Standard animals as well as our Mutation animals. We like to use the majority of our mutations as females so that we can put them with our highest quality standard males. It is our preference not to breed the recessives as we have watched ranchers over the years attempt to do this. On a small herd basis, it can be too slow to grow quality mutations. Tristan: Where do you see the chinchilla industry going in the next 10 years? The next 20? Is a lot of your business moving overseas? Shoots: (The) chinchilla is a world market today. We feel it is far better now then when we began. When we got started in raising chinchillas the fur market was very bad. There was no internet or hobby/pet avenue in which to market the offspring. The only market was selling breeding stock as a result of becoming known for quality through show competition. That is why we made such a huge investment in the industry in 1972 and 1973. To make chinchilla ranching work in those days you had to have quantities of quality standard breeding stock available to sell. A lot of the pelt production has moved to the South American countries due mainly to the fact of cheap labor in those areas. We always have and continue to market top quality Herd Improvement stock worldwide to breeders there wishing to improve their overall qualities. Thank you to Ralph and Barbara Shoots for providing this great information. You can find more information about their ranch at http://www.shootschinchilla.com/. Are you in the chinchilla industry? Interested in an interview and some publicity? Contact us!